There’s been a number of very interesting new releases recently featuring composers and performers from the Nordic countries. At the most unconventional end of the spectrum are violinist Vilde Sandve Alnæs and double bassist Inga Margrete Aas, a Norwegian duo who perform free-improvised music together as Vilde&Inga. Their new album Silfr, released last month on the experimental Sofa label, features ten pieces that demonstrate the fascinating way the duo utilises their instruments to explore a single idea. This in itself is quite refreshing. So much contemporary music seeks to cram shedloads of invention into even relatively short works that to hear such a single-minded approach as that on Silfr is somewhat novel, even courageous. The most extreme pieces are so unwavering as to seem almost behaviourally solipsistic. ‘Røykkvarts’ (“smoky quartz”) comprises an essentially unpitched texture of assorted scratchings and scrapings – so anonymous it’s hard to tell it’s being executed on string instruments at all – with occasional pizzicato pitches allowed to resonate. Though ostensibly more rapid, ‘Sprø Glimmer’ (“crazy glimmer”) is similar, placing high, unstoppable, glistening arpeggiations against an only slightly less intense tremolando, riddled with overtones, while ‘Aurum’ is located in weak, bleak territory, the instruments barely able to speak to the point that the background ambience becomes a distinct presence in its own right. The title piece is the most immersive of these, setting up a moto perpetuo of tremolandi and ricochets, stretching out notes at various points until the whole thing has its pitch content erased towards the end, culminating in the noise of frantic physical movements. Fantastic. One of the duo’s recurring paradigms is to establish a split musical personality, violin and bass pursuing different ideas but in such a way as to complement each other. ‘Usynlig Flimmer’ (“invisible flicker”), a piece that’s not so much slow as heavy-laden, is occupied with high ephemera from the violin while the bass grapples with an earnest exploration of chords. The momentum is reversed in ‘Urtjern’ (“iron ore”), tremulous undulations in the bass against sparse streaks of harmonic high above. ‘Karbontiden’ (“carbon time”) unites the pair again in a beautiful drone around which more and more pitches emerge, colliding with it, causing beats, building to a vast network of low grindings and high slashings – sounding impossible, as though many more than just two instruments were sounding; amazing to behold – before splintering at the very end. Just as striking is final piece ‘Skinnende Stein’ (“shining stone”), which spends half its duration caught up in more of Alnæs’ glistening violin harmonic arpeggios until Aas’ bass suddenly begins to growl loudly, to very striking effect. 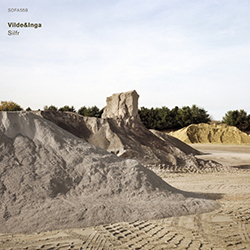 All told, Silfr comes across less as an anthology than a self-contained cycle, as the consistencies – timbral, gestural, behavioural, structural – throughout the pieces are such that they coalesce into a convincing whole. There’s something strangely nocturnal about it, which perhaps accounts for the fact that it regularly triggered shivers down the spine. 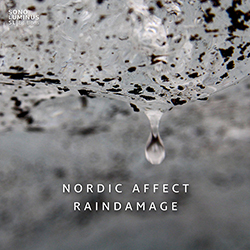 Icelandic ensemble Nordic Affect focus primarily on new music from across the Nordic and Baltic regions, in combination with an interest in earlier music. On record, however, they’ve restricted themselves to composers from their own country, in the process showcasing their interest in music that makes imaginative use of their instruments – string trio plus harpsichord – as well as incorporation of electronics. The ensemble released their first album Clockworking a couple of years ago, and while it had its moments, some of the pieces were pretty vague in terms of musical substance and direction, but their new album Raindamage – released a few months back on Sono Luminus – is very much more cogent. It features two works each from three composers, one electroacoustic, one purely electronic. Valgeir Sigurðsson‘s mindset seems to be ‘hands off’, though in an unusually stimulating way. In Raindamage he lets things sit for a time before establishing a gong-led pulse that provides the context for folk-like meanderings from the string trio, flecked with sporadic digitalia. His electronic work Antigravity sets up a slow-moving cloud of materials shot through with light but punchy beats, two layers of material that don’t so much interact as coexist happily. Both pieces, despite their ambiguities, are always very clearly on their way somewhere, keeping one’s attention locked on to their evolutions. Hlynur Aðils Vilmarsson‘s [:n:] eschews electronics (except for some subtle use of reverb), initially founded upon slick arpeggios before splitting apart in ricochets and strummed harpsichord strings; the piece ends similarly (the harpsichord notes so short and precise they seem almost synthetic) though takes a lovely detour through a dark, industrial-type texture, close-miced and intimate yet with a much larger sense of atmosphere. A real highlight of the album. His electronic piece noa::ems is more static, occupying a compressed/suppressed soundworld in which foreground elements drift amidst pent-up figurations elsewhere. Filigree threads get thrown in later, timbrally caught between acoustic and electronic, and Vilmarsson nicely twists things at the end, introducing an unexpected pounding, grungy beat. All very fine pieces, but the pair of works by Úlfur Hansson outshines them all. In electronic work Skin continuum, as the name suggests, he examines tappings on the skin of a drumhead, expanding them with sustained ‘chords’ that ultimately tilt the texture into a world of consonant warmth, through which the drumming continues but with its timbre constantly altering, a lovely combined effect. His 2014 Þýð involves the string trio’s voices in addition to their instruments, together constructing a suspended atmosphere made up of pitches strung loosely, with a recurring sound akin to a rising water droplet. Hansson’s concerned with more than just creating a beautiful soundworld, though, taking it through a series of crunchy climaxes that form an interesting counterpoint to the ‘angelic’ floating consonance of the ensemble’s voices. The last of these climaxes triggers a more heavy grinding outburst that leads to the music winding down as though it were all the result of an elaborate clockwork mechanism. It’s a marvellous conclusion to a bewildering but entrancing piece that throws elements of ambient and noise together and somehow gets them to gel. Trio Aristos comprises violinist Szymon Krzeszowiec, violist Alexander Øllgaard and cellist Jakob Kullberg. 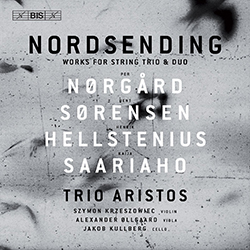 Though they founded in 2005, Nordsending is the trio’s only recording to date, exploring music from Norway, Finland and Denmark. Rift, by Norwegian Henrik Hellstenius, is the weakest work included here. Its development from sharp individuated attacks to a more melodic impulse is interesting, as is its sense of never quite settling, though its musical palette is sufficiently narrow that it’s hard not to glaze over from time to time. Finnish composer Kaija Saariaho‘s Cloud Trio will come as something of a surprise to those familiar with the kind of radiant opulence that typifies much of her work. Energy is channelled to ends that not inaccurately could almost be called minimalistic, manifesting in cycling rhythmic patterns, undergoing varying quantities of convolution. In the second movement, forward momentum is always apparent even when the music is seemingly focused on other things (such as extending a line) and the third becomes hypnotic, locked in a groove alternating between unison melodic bursts and ‘hissy’ articulations. The outer movements are more internalised, the first typified by phrases that begin strongly, executing various gestures or conveying an idea, that then die away, the trio very united, moving together, sometimes combining to form unisons or otherwise exhibiting a common behaviour. The fourth and last movement initially does the opposite, seemingly starting in medias res with all three instruments pursuing their own distinct ends; yet over time it becomes apparent that an overt melodic argument is shared by them all, with each taking turns to dominate or steer it. What’s particularly nice about these movements is that the terms used in each – ‘meditato’ in the first, ‘tranquillo’ in the last – are interpreted in a way that’s both true and immediate yet very far from familiar. The trio has a strong relationship with the music of Danish Per Nørgård, whose works they initially formed to record. Strings dates from 1992, and falls into a conventional classical structure of movements: Moderato, Allegro, Adagio, Presto. Its soundworld is less demanding than more recent Nørgård. The Allegro relentlessly pursues a playful but angular rhythmic motif, and the Presto is similarly keen and extroverted, in its latter half displaying a strong sense of perspective, phrases projected into the foreground while rhythmic regularity continues behind. The other two movements are both highly beautiful. The Adagio is pensive, considered music, as though the instruments were listening carefully to each other, while the opening Moderato is a highlight of both the work and this album as a whole, its exquisite lyricism seemingly refracted, with interrelated pieces of material striking off and interpenetrating each other. Most striking of all, though, is the music of another Dane, Bent Sørensen, whose 2010 work Gondole begins the disc. The impression it’s going to make is not immediately obvious, preoccupied at first with harsh accents and material that slip-slides around. But the four movements that follow are simply dazzling. Tentative, muted lines that both work together and stray over each other, eventually forming something like a chorale (the second movement); a soloistic pizzicato cello becoming the basis for hoarse imitations from violin and viola, culminating in a lovely cantabile melody (the third); swooping sul pont. glissandi and harmonics that again find their clarity in a wondrous, united melody (the fourth); and a litany of restrained little surges, as though the trio were inching forward, clustered and tremulous, still clinging together through more assertive gestural swoops until they practically dissolve away in an episode of ghostly lyricism (the fifth). Nordsending is a fabulous disc, but it would be worth having for Sørensen’s Gondole alone; what an absolute chamber masterpiece. 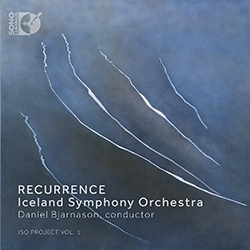 And it’s back to Iceland, only now with significantly larger forces, for Recurrence, a new release from the Iceland Symphony Orchestra, conducted by Daníel Bjarnason. Once again, it’s devoted to the music of Icelandic composers, this time – thankfully – including women. As with so much contemporary orchestral music, there’s a distinct tendency to the textural, sometimes at the expense of a coherent sense of direction. Both Hlynur Aðils Vilmarsson‘s BD (heard on these shores a few years back courtesy of the BBC Scottish Symphony Orchestra) and María Huld Markan Sigfúsdóttir‘s Aequora suffer in this respect; though both have arguably more than their fare share of moment-by-moment beguilements, neither offers an entirely convincing navigation through their ideas, and the fact that both finally resort to somewhat filmic gestures doesn’t help their respective causes. Yet superficially, they’re undeniably enjoyable, and at times strikingly attractive. Thurídur Jónsdóttir‘s Flow & Fusion has very much more depth, offering possible glimpses of line within its own lovely, rich textures. Her musical materials feel physical, plastic, and she moulds them such that loud bursts and surging swells erupt yet continuity is preserved. Only for so long though: later, quite deliberately, she initiates a scratchy climax that sounds as though there are hard-edged pieces of something within it, which then splits down the middle into a soundworld of small, high tremolandi and very low moments of brief movement. Daníel Bjarnason‘s Emergence takes its time; the first of its three movements is like a four-minute tease, presenting alternations of quiet suspension amid rumbling crescendos, a rolling sequence of peaks and valleys seemingly of equal importance. Only at its close does Bjarnason ramp up the intensity; both this and the start of the next movement suggest blunt force is the way forward, though this is qualified by the unexpected dominance of a series of brass chords that transform the orchestral texture and very clearly provide guidance as to its shape and direction. This is reinforced further in the lengthy final movement where the gist of this idea is turned into material slowly sliding downwards (somewhat Shepard tone-like) on extremely soft strings. Bjarnason allows the dynamic to grow and ebb, begging the question – considering the title of the piece, shared by this movement – of what, if anything, is going to emerge. It’s not a question that’s definitively answered (and that’s all to the good), the music instead attaining huge climactic force, embodying further impressive surges troubled by some brass-heavy grumble gestures, whereupon it fades to what may or may not be nothing. The most telling work on the disc is Anna Þorvaldsdóttir‘s gorgeous Dreaming, which displays both the greatest invention and the most masterly control over it. The opening texture here is a veritable soup: soft percussive tappings, granular and pitched elements, glissandi, tremolando clusters, phrase morsels, chords coalescing somewhere. From this nascent broth of possibilities Þorvaldsdóttir gradually starts to instigate the formation of sound objects, seemingly under their own gravity. There are moments of violence in these formative acts, though these too feel like creative contributions to music that doesn’t so much gain pace as gather momentum and clout. But this textural space is unpredictable: it evaporates into a low miasma from which melody emerges, coloured with repeated chimings, and this too becomes lost within a gaseous environment where isolated gestures are dispersed around and vestiges of pitch remain hanging in the air. Pure magic. One final thought: the booklets accompanying some of these discs contain no programme notes about the pieces whatsoever, speaking instead more generally about the music and the conceptions behind them and the album as a whole. To my mind, this is not in any way a bad thing; too many composers treat programme notes as either miniature adverts or not-so-miniature tracts of rambling verbiage. To be able to approach these works on their own terms, without a surfeit of ‘informative’ baggage, was extremely stimulating and beneficial. Less is more. Thanks for these detailed reviews. Got a couple of the CDs that I wouldn’t have know about otherwise. The Saariaho is indeed surprising – would never have guessed those middle movements could have been written by her. But great composer are not one-trick ponies.